The Society for the Psychological Study of Social Issues is an organization of social scientists that has historically brought research to bear on a wide array of societal problems. SPSSI was organized during the Depression of the 1930s, in an attempt to bring together a “national group of socially minded psychologists” to address social and economic issues (Finison, 1979). While maintaining its status as an independently incorporated society, SPSSI also became an affiliated organization of the American Psychological Association from 1937 to 1945, and Division 9 of the APA from 1945 to the present (Kimmel, 1997). SPSSI members and professional historians have taken several opportunities to look back at the organization’s impact on the discipline of psychology and on society at large. Twenty years after SPSSI’s beginnings, two of its earliest members, David Krech and Dorwin Cartwright (1956) evaluated its progress. On the occasion of SPSSI’s 50th anniversary, two special issues of the Journal of Social Issues(Harris, Unger & Stagner, 1986; Levinger, 1986) brought together the reminiscences of elder members with a thorough treatment of its origins and activities. To honour SPSSI’s 60th anniversary, a special issue of the Journal of Social Issues brought together a wide range of historical scholarship dedicated to examining SPSSI’s unique place in building a socially responsible psychology in the 20th century (Harris & Nicholson, 1998). SPSSI also figures prominently in broader social and disciplinary histories of science, American civic society and international peace and conflict (Capshew, 1996; Herman, 1996; Jacobs, 1989). 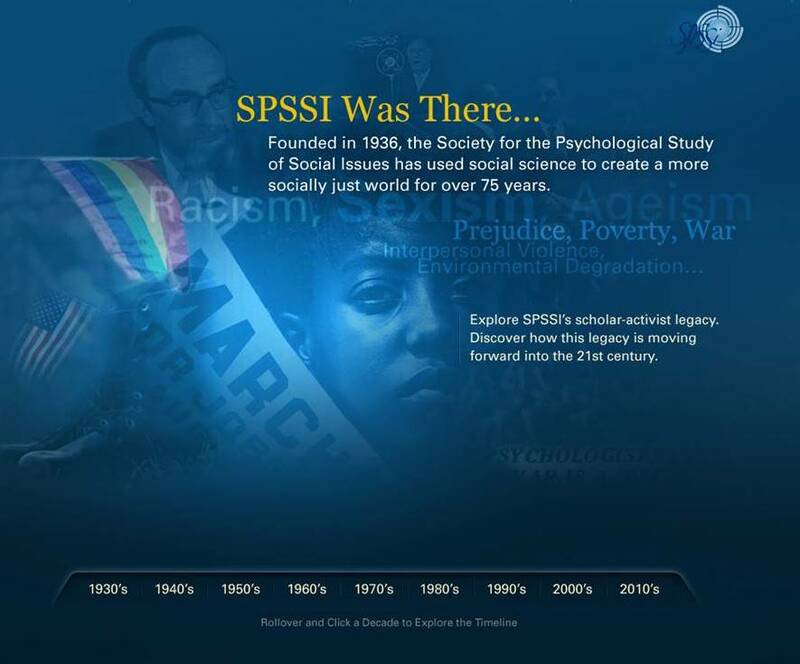 For an interactive look at SPSSI's history, please visit our timeline by clicking the image below!